The first and only fully programmable data converter for access systems. The converters has two inputs and two outputs. One of the inputs supports either track 1 magstripe, track 2 magstripe, or standard wiegand. The other input supports rs232 serial. 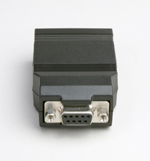 For Usb support, see the model 718 converter. Each input is programmed separately and operates independently of the other. The converter supports full masking and reorganization of data from both input ports. It can change the organization of wiegand bit streams, insert or override site codes, id numbers, issue codes, and constants. Both MSB modes and LSB modes are supported. Additionally, characters, numbers, or bits can be deleted, inserted, or extracted from any received data prior to transmission. Parity checking can also be enabled for the purpose of reading standard legacy wiegand cards in both directions. Serial-to-serial masking, and preprocessing functions, to support Amtech toll tags, are also standard features. 716 Data Converters are also avvailable with an on-board relay. See model 716R. Standard Wiring Db9 for rs232 connection. Rj45 with supplied flat cable for wiegand inputs and outputs.